Everyone knows Uber. Unlike Marmite, it seems possible to love and hate this service at the same time, but it is just as hard to ignore. Uber's contradictions are becoming as famous as its world beating service model. It solved perhaps the biggest problem taxi drivers face - fare dodgers - and yet it's hated by taxi drivers like the plague. It has become one of the biggest transport-providers in the world and according to the BBC in 2018, it saw a 24% increase in revenues and a 37% rise in gross bookings. However it still registered an adjusted loss - following a tax benefit - of some $1.8bn. As it gears up for its first public shares offering this month, we take a look at the world beating App that is going public in more ways than one. Plans to launch its first public share offering this month with a valuation of $120bn. Fred Jones, director for Uber UK, says: ‘Average users in a car in UK is just a shade over one. There is a lot of empty spaces and there is a lot of cars making single journeys. Over 20% of worlds emissions today come from transportation. Cars spend most of their time sitting empty - about 95%. In central London today about 16% of land is dedicated to parking. Think about the pressures on housing and green space. The plan is built around three key pillars: increasing shared modes of transport, increasing electrification and zero emission, and multi-modal transport. Car sharing service Uber Pool was initially launched in 2014 and operates globally in about 40 cities completing around one billion trips so far. Uber has identified the long-term benefits of switching to an electric fleet and just as cities are implementing charging zones to improve air quality, Uber has developed a way of paying for it. Mr Jones says: ‘In London we launched the clean air plan. In central London, a 15p surcharge is added to every mile we collect that and give 100% to the driver to help them purchase an electric vehicle. We estimate that is going to generate between £200m - £250m over the next five years and will go directly to purchasing electric vehicles in London. In Denver in the US, Uber launched an integration of public transport into the app, showing transport options. Last year, this mobile ticketing and software-as-a-service (SaaS) service announced a new strategic partnership with Uber to add public transit mobile ticketing into the Uber app. 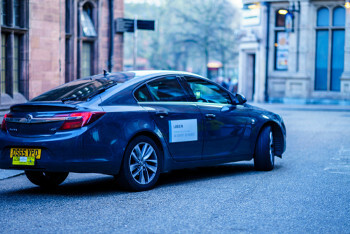 Data analysis conducted by Uber also shows its connection to the transport authority’s services in subtler ways, demonstrated by the London Night Tube service. Mr Jones says: ‘Frankly we didn’t know what the impact would be. Clearly the Tube would be cheaper. We saw in the six weeks after the night tube a really big decrease in people requesting an Uber in the centre of town but we saw a corresponding increase in stops at the end of the line. Data analysis like this is something Uber can also help cities with through the free to use Uber Movement, tool. Last year Uber acquired the electric dockless bike-sharing service Jump. Mr Jones says the move was a risk: ‘We didn’t know how this would go down. The first thing we saw was that peak time for bikes was during the day when congestion was at its height, whereas the key time for Uber cars is early morning or late at night. So there is a natural complementary nature between the two types, which is good if you want to provide a one-stop mobility shop. That of course is the key issue here. The car itself is no longer the driver of social or behaviour change or personal mobility. The baton – before it is eventually handed back to driverless cars, something else Uber is investing in – has been handed to the phone and its ability to revolutionise the mobility market.